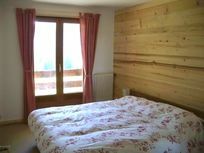 In the sunny Alpine village of Le Tour, near Argentiere, Mont Blanc Chalet makes a cosy, contemporary home-from-home for hitting the ski slopes and simply throwing back the curtains each morning to gob-smacking views of the Mont Blanc valley. 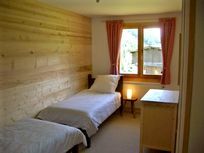 The recently renovated chalet is especially well kitted out for parents with babies or toddlers, in a handy location for getting youngsters into skiing, being set within 300 metres of the lifts and ski school, which offers lessons for 3-year olds upwards and adjacent nursery slopes. 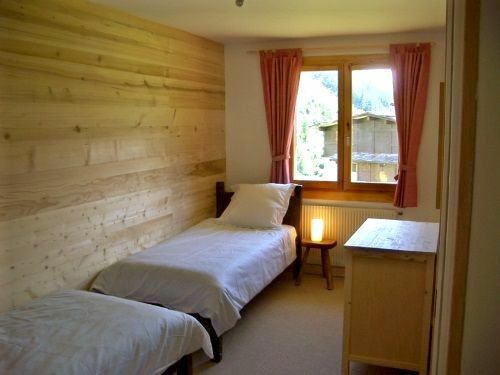 The owners also recommend the English speaking lessons at the local Panda club in Argentiere, which is just 3kms away (easy public transport links) and offers a lovely selection of shops, bars and restaurants too. In summer, the chalet provides the most spectacularly Heidi country for happy hiking and picnics in the Alpine meadows, with an all-terrain 3-wheel buggy helpfully provided for rougher trails. Mont Blanc Chalet is one in a small cluster of chalets surrounded by a large, grassy car-free area for children to play safely and a wheelie cart is available for bringing luggage the 80m to the house. 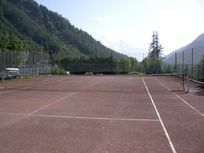 Guests have free use of a shared tennis court and when snow covers the ground families can ski right up the chalet door, build snow men and tow each other along on sledges. 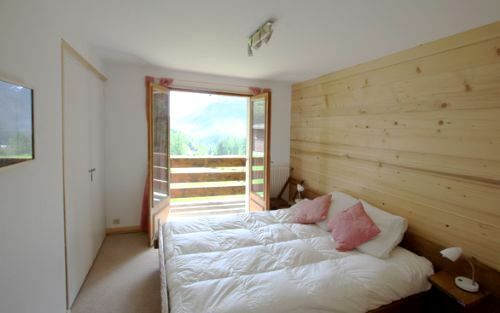 The chalet is set over three levels with access through a large porch on the middle floor where parents will find the master double bedroom with a south facing balcony, plus one twin room, a bathroom and separate shower. 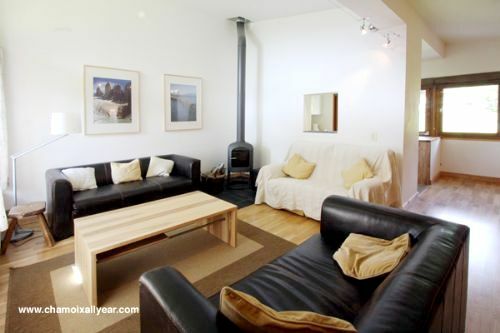 Two more twin bedrooms, a shower room and separate WC are on the ground floor while the open plan living room occupies the top floor to make the most of the amazing views. 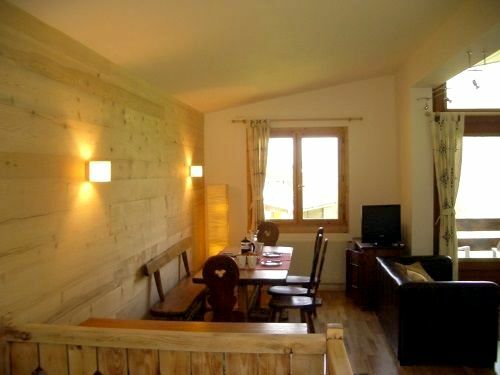 Natural pine and a rustic dining table are true to the Chalet’s traditional Alpine style but the overall furnishings and finish is stylish and modern, including leather sofas, a funky wood burner and flat screen TV with UK Freeview channels. 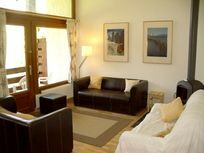 The living area is wonderfully light and airy, with high ceilings, big picture windows and glass doors to a large enclosed balcony. 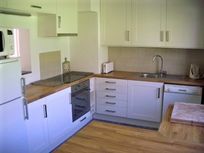 The kitchen is spacious, modern and well equipped for self-catering with kids, including a steriliser, blender, microwave and dishwasher. 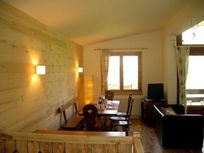 A box of toys is provided and the Chalet has a DVD/CD player and Wi Fi. 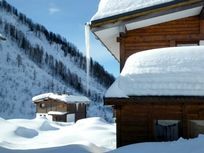 Mont Blanc Chalet sleeps up to 8 family and friends plus a baby in a travel cot provided which will fit in any of the four bedrooms. 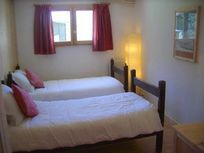 The Chalet is set over 3 floors with access on the middle level where there is one double bedroom, one twin bedroom, a bathroom and separate shower room. Two more twin bedrooms rooms, a shower room and WC are on the ground floor. For winter sports enthusiasts and simply to be engulfed by breathtaking Alpine scenery, Chalet Chocard offers a quiet, family-friendly setting on the edge of the small village of Le Tour, set in a wide open space that gives uninterrupted views of a magnificent valley soaring up to mighty Mont Blanc. There are two local restaurants in the village and shops, bars and restaurants in the livelier little town of Argentiere, just a 3km drive or bus ride away. 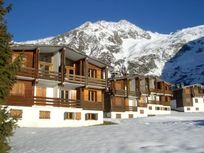 When it comes to the skiing, Chalet Chocard is in a great spot for all ages and abilities to get on the piste, located at the foot of one of the four prestigious Chamonix ski areas. 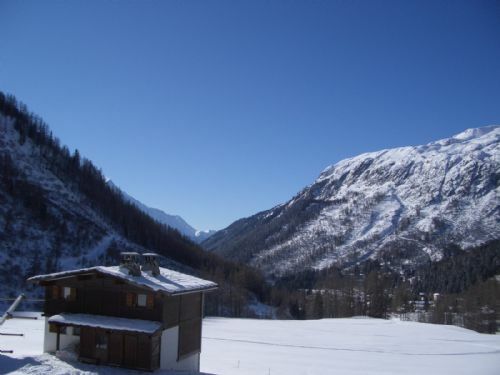 The Charmillon ‘telecabine’ is just 300 yards from the chalet which gives access to the whole Domaine de Balme ski area, including blue and red runs that are ideal for intermediate skiers, as well as lovely tree lined pistes into Vallorcine. Also by the ski lift is one of the region’s largest beginners areas with nursery slopes and a ski school which offers lessons for 3 year-olds upwards, plus the green runs of La Vormaine. Other ski areas are just a few minutes away by ski bus or car. Whether a skier or not, Chamonix is one of the Alps most happening resort towns all year round with an excellent variety of shops, cafes and restaurants plus an indoor/outdoor swimming pool. Families can also hop aboard the Montenvers mountain train to La Mer de Glace or take a cable car to the Aiguille du Midi. 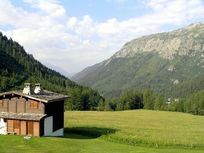 2.5 kms from Chamonix, Le Paradis des Praz is a great summer spot for families, with play areas, pony rides, cafe and a stream that feeds a small lake for paddling and swimming. 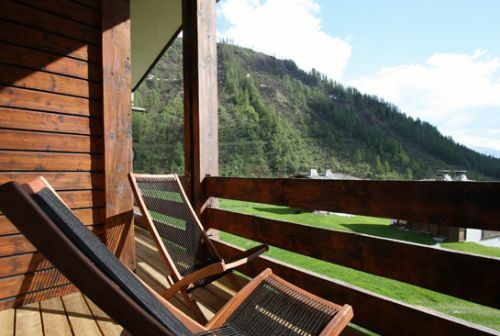 Throughout the summer, the valley is a hiking and picnicking paradise, with walks in all directions from the Chalet into lush Alpine meadows and beside fresh mountain streams. Mountain bikers are increasingly flocking to the hillsides and hopping into the ski lifts makes going up so much easier! At Merlet Nature Reserve, animal lovers can spot free ranging Alpine species including the giant hamster-like Marmotte, impressive Ibex and Chamois antelope. Geneva is the nearest airport (approximately 1 hour 15) with flights from across the UK provided by operators including easyjet and BA. 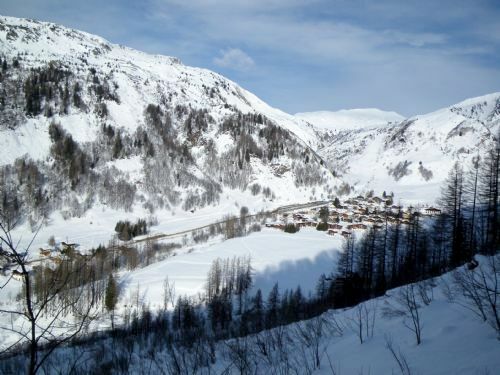 To take the ferry and drive to Chalet Chocard takes approximately 7 hours from Calais. Nearest Medical Services (GP & A&E): GP services are available in Argentiere (5 mins drive). 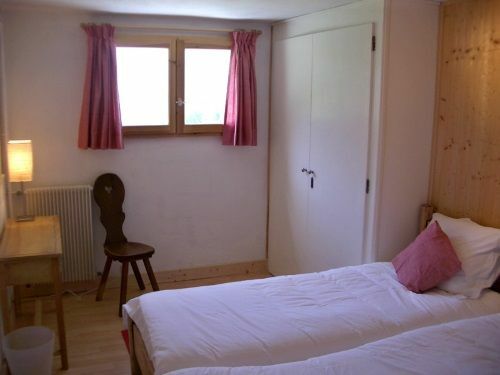 A&E in Chamonix (15 mins drive), with a larger hospital at Sallanches (30 mins). We are a family of four, with 2 kids age 6 and 3. 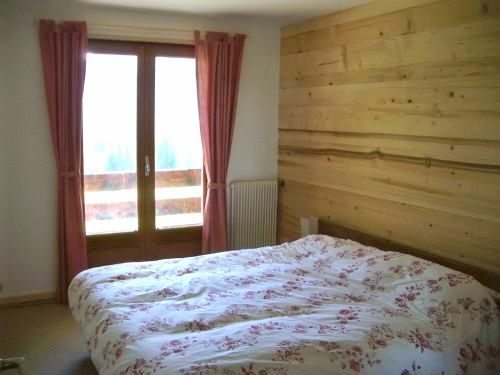 We've had the chalet for 7 years now, and renovated it when we bought it. We live in London, so Chalet Chocard is our escape from the city and we go whenever we can. 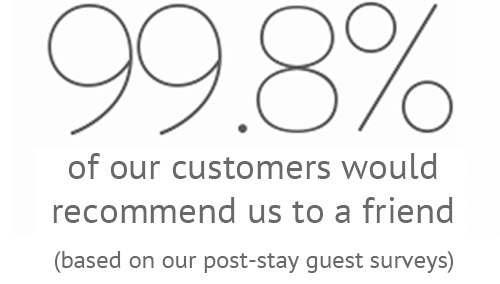 Whenever we arrive at the chalet we "switch off". The views are beautiful and we love the fact that you can walk out the front door and head straight off on any number of walks, or up the mountain to ski. In the winter you sometimes see huskies pulling sledges across the field in front of the chalet; in June the same meadow is filled with flowers and in summer you hear the tinkling of the bells as the cows graze outside. Because the bedrooms are on 2 floors the chalet works very well for 2 families. Our kids love the freedom of being able to run straight outside and play in the grass or on the tennis court in summer, or make snowmen and sledge in winter. Cars are kept in the car park (approx 70m away) so there is no traffic outside the house. There is lots to do with kids. 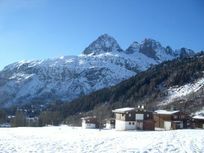 In winter, of course, there is sledging and skiing (as well as an indoor icerink and a very good kids and adults pool, in Chamonix). In summer our kids go on "treasure hunts" as we walk, seeking out wild strawberries, raspberries and blueberries. In summer they love the "go ape" adventure course (suitable for kids from 1 metre tall, up to adults), hiring bikes to cycle round the valley; the parks in the forest where they can paddle in the (freezing!) water; the outdoor paddling and swimming pools in Chamonix. Sleeps 8 + infants in 1 x double bedroom and 3 x twin rooms. Travel cot, 1 x highchair, baby bath, microwave steriliser, changing mat, potty, stairgates, bed guard, plastic crockery, plastic cutlery, blender, and a 3-wheeler buggy suitable for rougher tracks. As basket of toys is provided. In the winter sledges are available for kids to use. All but one of the staircases are gated. Private terrace and plenty of grounds to run around. The chalet has a log burner.